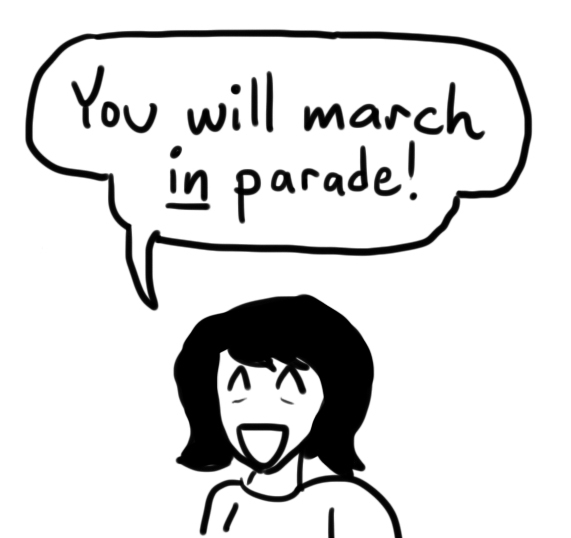 What sensei told us: “You’re going to be walking in a parade!” What she should have told us: “You’re going to be walking in a parade for 7 hours straight!” | I think in comics. There’s this festival that takes place in Sapporo every year celebrating the Hokkaido Shrine. One of the ten largest celebrations in Japan, it takes place in mid-June to welcome the summer. 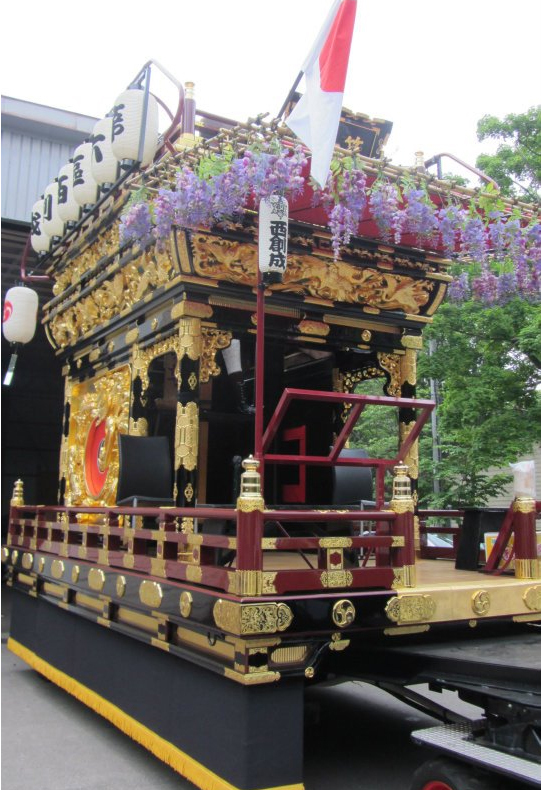 The Hokkaido Shrine Festival, as it is creatively named (also known as: the Sapporo Festival) features a parade with floats, music, and four mikoshi (portable shrines) that are marched around the city. I believe the mythology is that four deities reside in the Hokkaido Shrine: Okunitama, the god of the land in Hokkaido, Onamuchi, the god of developing the land, Sukunahikona, the god of healing, and the soul of Emperor Meiji. According to legend, these four deities ride around Sapporo in the four parade mikoshi. That way, they get to view the city, see how their people are doing, and basically check in on how the world is doing. It sounds like an interesting parade. Luckily for my group, it was taking place our last weekend in Japan. We would get to see it! Right? The sensei who led our trip was actually from Sapporo before moving to America. We discovered that she had all the connections. One of these connections was somehow getting the city to let we Americans march in the parade. Pulling one of the floats. Wearing traditional Japanese yukata provided by the city. Going to not only be in the parade, but also be at the front of it, as the leading float in the whole shindig. We discovered, to our great relief, that the float was actually pulled by a cart. We would only have to walk in front of it, symbolically carrying two ropes attached to the front. 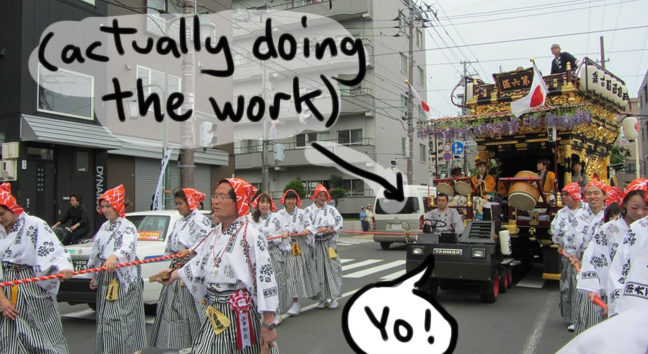 What our sensei hadn’t mentioned was that the parade was going to last, oh, like seven hours or so. And we were all wearing traditional Japanese geta sandals, which aren’t the comfiest. At least the seven hours weren’t nonstop. We did have a lunch break in the afternoon, with free food! And I– don’t hate me for this– cheated at the end. At the very front of the parade were three rickshaws for paraders to ride in. Our sensei, unable to walk for so many hours, had cozied up in one the whole time. That left two available for us. 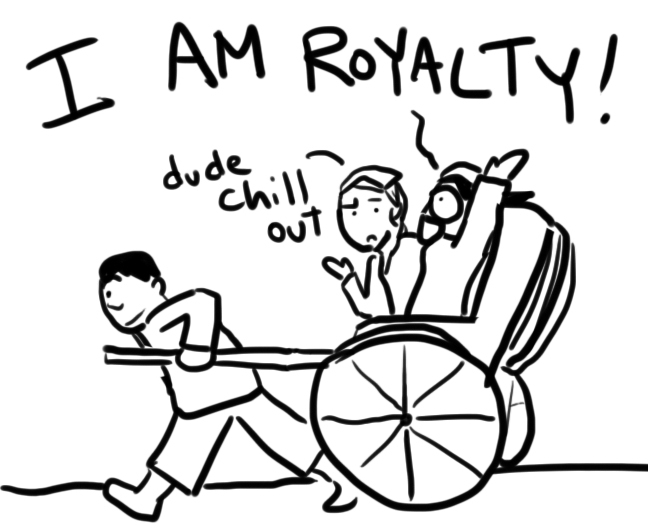 I’ve never ridden a rickshaw before. This was my chance! The crowds that came out to see the parade were incredible! My gaijin group was especially ogled over. Walking with your friends, getting treated to breakfast and a buffet lunch, getting to wear traditional yukata, and being gawked at by passerby? It was super fun. 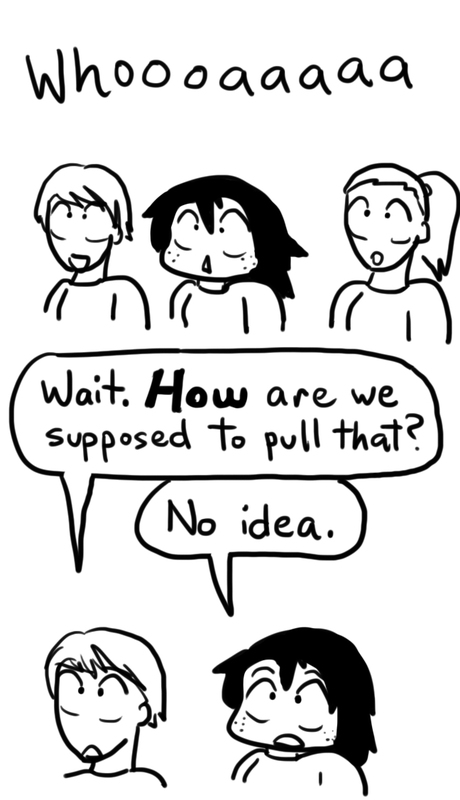 I still have no idea how our sensei managed to hook us up with this. It was a once-in-a-lifetime kind of thing. So, at the end of the parade, sore feet and hungry stomach regardless, I felt extremely lucky. 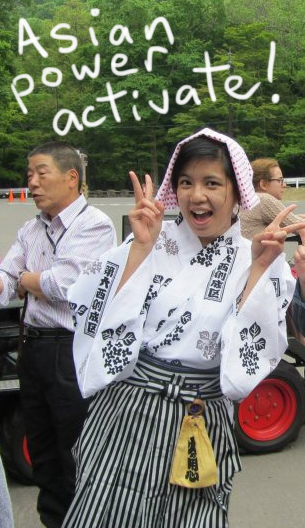 Even the bruises from my tightly-wrapped yukata couldn’t bring me down. It’s so cool that you got to experience awesome stuff like this Vy! So jealous! Ahhh I was so lucky that I got to go on that trip! I feel super-fortunate! That was great! 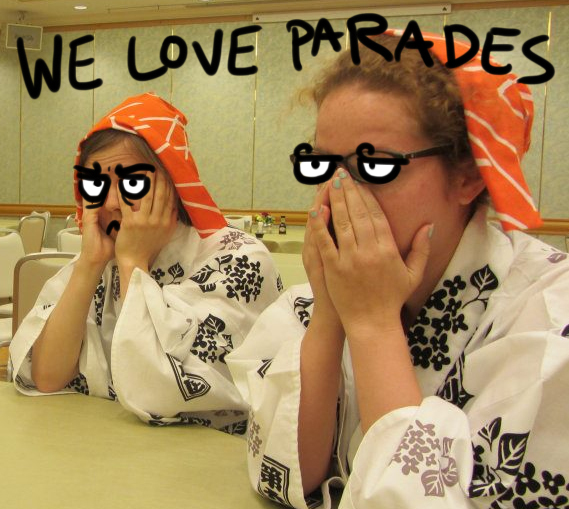 The title was funny, and then I was impressed that your sensei had gotten you into the parade. BUT I LOST IT WHEN YOU SAID THAT YOU WERE AT THE FRONT OF THE PARADE! WHAT KIND OF CONNECTIONS DOES YOUR SENSEI HAVE!?!? SHE HAS ALL THE CONNECTIONS! I didn’t mention this in the post, but right after the parade was over we were invited to a post-parade celebration. As it turns out, this little dinner party was full of all the parade’s sponsors, who were all rich business owners or company higher-ups! I think the Japanese term for this is “お金持ち” (okanemochi, literally “having money”) and it was these people who let us into the parade. How did sensei know all these guys? WE STILL HAVE NO IDEA. Seriously, there were a lot of things we did on that trip that we couldn’t have done as a normal tourist! That’s a good way to put that parade– super-awesome, but totally exhausting! 😛 I’m glad you enjoy my blog– I try my best to make it funny! That’s such a an awesome experience Vy! 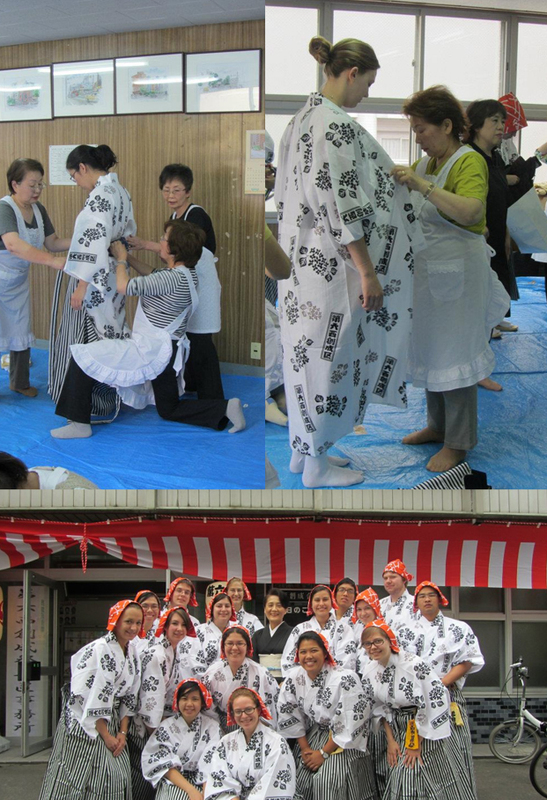 And those yukata are beautiful! 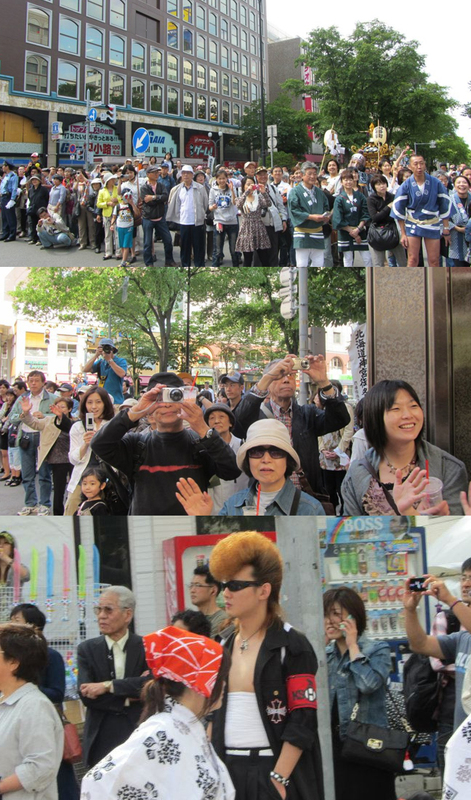 Is that guy in the crowd with the pompadour a member of one of Japan’s rockabilly clubs? It is amazing what our bodies will allow us to go through in order to have great once-in-a-lifetime experiences or when absolutely necessary. The things I did after the stroke during rehab, I am still amazed I didn’t pass out at times. Agreed! Also, that’s amazing that you managed to recover from a stroke. Rehabilitation is never easy. Congrats!